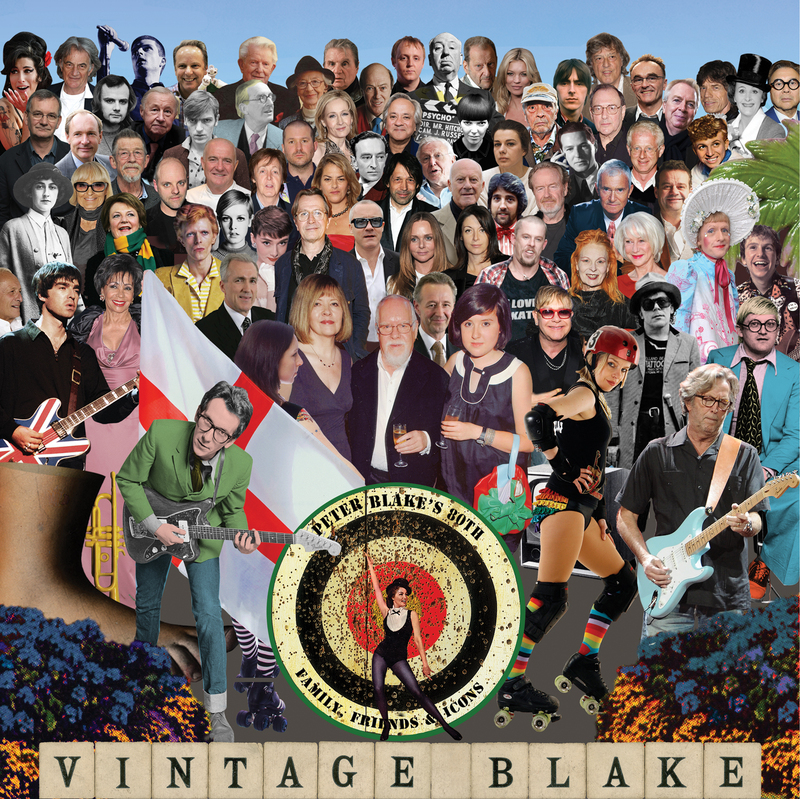 Sir Peter Blake, often refered to as the ‘Godfather of British Pop Art’ is exhibiting for the first time in St Ives, at the Porthminster Gallery from 3rd August to 7th September. The exhibition will consist of signed silkscreen prints of recent work. Sir Peter is most famous for his iconic album covers for the Beatles, including Sgt Pepper’s Lonely Hearts Club Band. He has also worked with The Who, Oasis, Paul Weller and Madness. His images “capture the effervescence and optimism of the Sixties, with the use of bold geometric patterns and primary colours” according to the gallery. The work also incorporates comic strips, advertising texts and photographs. Humourous and nostalgic, this is a must see show if you’re visiting St Ives this summer. Porthminster Gallery is situated at Westcott’s Quay, which is a five minute walk from the restaurant in the direction of the harbour. Visiting the show? Click here to make your table reservation with us before or after. If you’re planning a visit to us this Easter and have time to explore St Ives a little, you might like to take a look at one of our favourite galleries. Porthminster Gallery moved into new premises last year at Westcott’s Quay, which makes a fantastic after-lunch stroll from the Café. The gallery deals in modern and contemporary British art and has gained a strong reputation in recent years. Work shown includes paintings, sculpture, original prints and ceramics by highly-collected St Ives and invited UK artists. This Spring, Porthminster Gallery is showing ‘Process: making a mark’, a collection of new works which explores mark-making, layering, and additive and subtractive processes. Painters on show include Angela Charles, Tony Scrivener and Anne Davies, ceramics are by Elly Wall and Stephanie Pace, and sculptures by Margaret Lovell FRBS RWA and Peter Hayes. We think Angela Charles’ work sounds particularly interesting, as her chosen location looks directly back at us here at the Beach Café. “From the campervan pitch on the edge of the dunes at Gwithian, with magnificent views of St Ives and within walking distance of some of the most stunning Cornish coast, these works have evolved from pen sketches and written notes about the surrounding landscape, the light and the sea. These records act as a catalyst for my paintings which, rather than a direct response to a certain place, represent a memory of a location and the felt experience of being there. However, in some of the works I become so absorbed by the painting process that little is recognisable from the original sketch. Across the bay from the café, Godrevy Lighthouse played host to an intriguing and unique art installation last week. Unfortunately Peace Camp 2012 wasn’t visible from our vantage point at Porthminster, as the artwork was tucked away on the other side of the island, so we decided to take a closer look. Peace Camp 2012 is part of the London 2012 Festival and was designed by Director Deborah Warner in collaboration with the actor Fiona Shaw. The brief was to create a coastal installation encircling the UK which celebrated it’s variety and beauty. What the team came up with was “eight murmuring, glowing encampments” which appeared simultaneously at some of our most beautiful and isolated coastal locations around the British Isles. Designed to be visited between dusk and dawn, the glowing, orange tents appeared on rocky promontories, beneath ruined castles, on remote pebbly beaches and nestled against white cliffs. At Godrevy, the tents were sited under the lighthouse. This was built in the 1850s after several shipwrecks occured off the rocks here. The lighthouse was manned by a team of two, until it was automated in 1939 and the lighthouse keepers left the island forever (it is now run on solar power.) Godrevy is said to be the inspiration for Virginia Woolf’s To The Lighthouse. She had several family holidays in Cornwall, although the book was actually set in the Outer Hebribes. Now the setting for one of the eight ‘camps’ encircling the UK, the tents on Godrevy were lit up like a sanctuary, the distance short but trecherous. As dusk gradually fell, the tents shone bright and brighter, the orange glow capturing the colour of the disappearing sun set. Crowds gather from dusk till dawn…. We’re impressed with this new exciting age of art work in unexpected places, including last year’s Cornwall Design Season and Artsmine this year. Keep it coming and if anyone has ideas for an installation at Porthminster give us a shout!